British nuclear submarine HMS Talent suffered a huge gash to her conning tower after hitting ice floes while tracking Russian vessels and will be out of action for several months for repairs, according to Royal Navy sources. The collision ripped a six-foot hole at the top of the vessel, and although defense officials refuse to disclose exact details of where and when it happened, they insist the damage occurred after hitting floating ice and not after a collision with another vessel, The Mail on Sunday reports. The incident happened some time last year and comes amid heightened tension between Britain and Russia beneath the North Sea and its airspace. Sources in the Royal Navy say the damage to the sub is consistent with striking an object while trying to surface. Repairs are expected to cost £500,000 ($746,000). “Striking ice is a problem of the environment we work in. Some patches of ice show up on our scanners but not all, with the density of the ice also being a factor. On this occasion some damage was sustained by HMS Talent,” said a navy source. 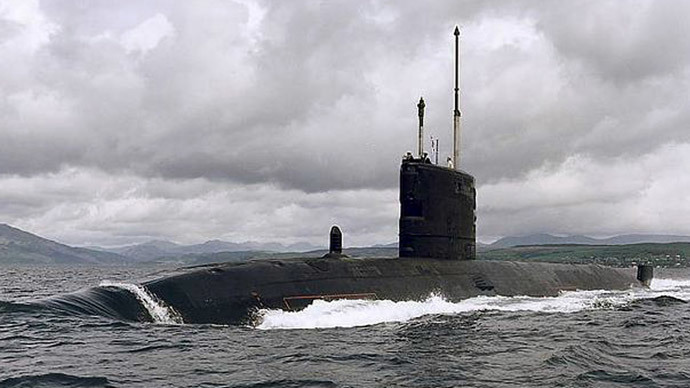 Surfacing can be risky for submarines because their radar doesn’t work underwater and their sonar equipment looks ahead rather than up above. HMS Talent was photographed with the damaged conning tower arriving at Devonport in Plymouth last month. A navy official insisted that despite the expensive gash, she remained operational throughout her deployment. The collision also caused huge damage to her outer layer of acoustic tiles, which minimize the submarines transmission of sound waves and other noise, which could reveal her position. Therefore continuing a normal deployment would have been problematic. The explanation that HMS Talent hit ice was also used throughout the Cold War, when British submarines had in fact collided with enemy vessels. The 5,300-ton HMS Talent entered service in 1990 and can be used for a surveillance role in tracking other ships and submarines.